Alongside many popular Asian hairstyles, samurai hair seems never to lose its popularity. And even though modern samurais come as hipsters, the centuries-old history of the Japanese hairstyle makes it look sophisticated, refined, and masculine at the same time. First, samurai hairstyles, or chonmage if you please, were designed to keep a warrior comfortable with his hair during the battle. 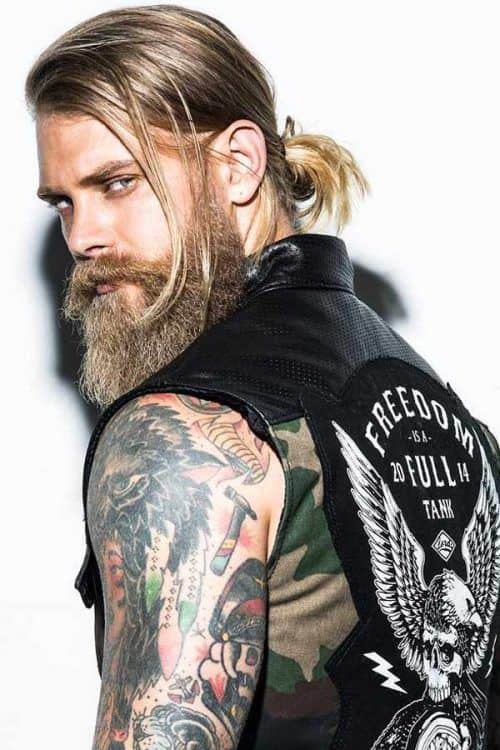 Nowadays, they’ve transformed into stylish man buns and top knots that men pull off to stay on guard for the modern men’s fashion. Of course, the style has changed through the time: it’s become more diverse and versatile. But it still preserves the characteristics that every man wants his hairstyle to have: simplicity, dignity, and distinctiveness. Today we will show you how to involve them in your style: see how to achieve, create, and wear the newly emerged men’s trend! As the name suggests, the everybody’s favorite hairstyle takes its roots from traditional Japanese warrior styles. The initial idea of samurai hair features the cleanly shaved top of the scalp and long hair tied into a ponytail. Once the ponytail is ready, the hair gets folded into a high knot-like chonmage that lies on the shaved area, keeping the warrior’s helmet well-centered. 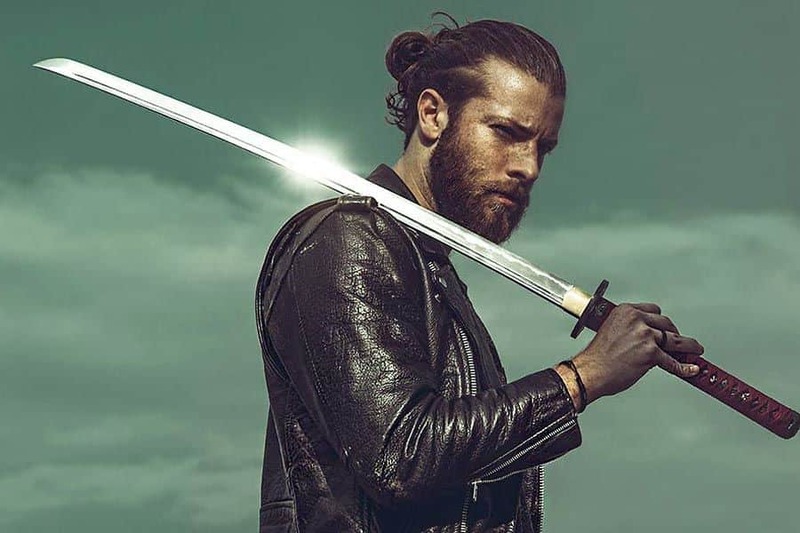 The simplicity of the samurai hairstyle is probably the main reason for modern gentlemen to sport it: the only things you need to bring the idea to life is your long hair and a hair tie. To get the style, you’ll need to simply gather your hair with both hands, twist it at the back of the head and secure it with a tie. Don’t forget that for an authentic samurai look you’ll need to pair your bun or top knot with shaved sides of an undercut or a fade. Such ideas require regular maintenance, so your task is to make sure you’ve got enough length on top and clean precision on the sides. Also, if you want to both individualize and modernize the style, wearing it with a beard of stubble will be a good idea. In this way, you can make your look fit your facial features perfectly. This part will be useful for those who have never styled a classic man bun, as, actually, it’s a lot like samurai bun hairstyle. Obviously, there’s nothing complicated about the ‘do, but these simple basics won’t hurt. Before creating a ponytail, decide where you want the style to sit. Choose a point at the back of your head, and gather your hair in a pony right at that point. Regulate the height of the knot based on your hair length; if your hair isn’t long enough, you can make the bun a bit lower. When doing a knot, make sure that the ends stick out from under the elastic. Now, it’s time to see the modern versions of samurai hair. The best thing about this style is that despite the simple and strict appearance it can be customized in any way you want, fit elegant men’s lifestyle, and give a recognizable look to wearers. See how it works! As you can see, the samurai man bun above doesn’t involve super shaved sides and top, but it still looks pretty smart and outstanding. Unlike most popular man buns, this idea sits very high at the top, cascading to the grown-out sides and giving a lot of lift to it. As for the goatee, it finishes the casual look awesomely. 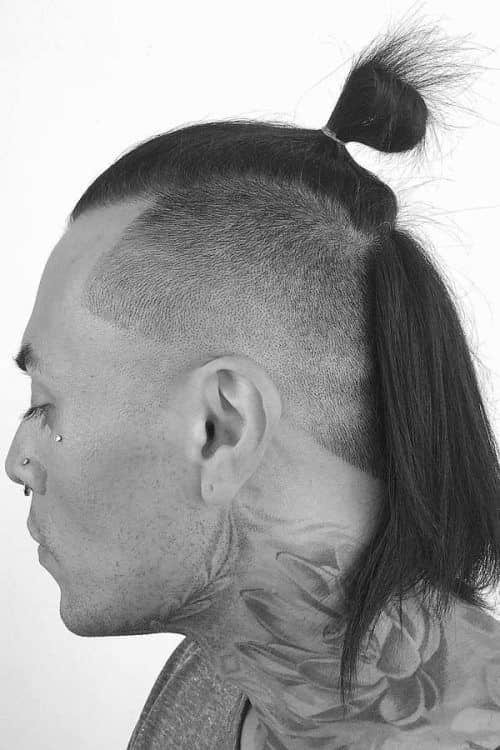 Here comes one of the Asian hairstyles men from all over the world would like to copy: the samurai haircut with an undercut and ponytail. The overall silhouette resembles the main features of samurai styles while the short on sides long on top combo takes it to the advanced level. Who knows, maybe you’re the samurai who prefers to show off this long hair and stop on the ponytail step. 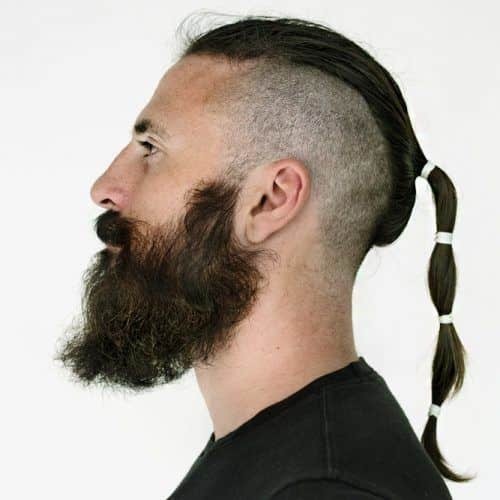 The long samurai ponytail isn’t something we’re used to seeing on every single man. 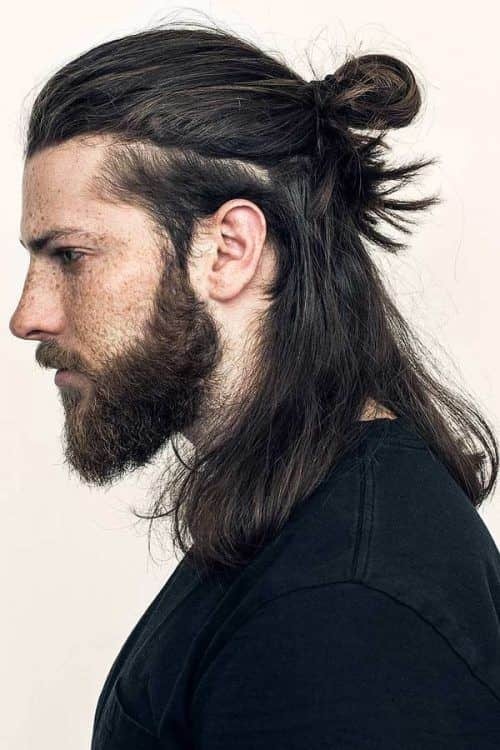 You need to be one of the bold men with long hair and unique style. The idea of slick back hair goes perfectly with such Asian guy hairstyles as samurai hair. Not only does it give a sleek and tidy look but also keep the authentic silhouette. If you’re into convenience and minimalism, look no further. When we said that Japanese hairstyles offer you a great room for customizing the ‘dos, we weren’t joking. The truth is, this particular half-up is more like a Witcher-inspired hairstyle. But it actually looks very sophisticated with the beard and knot on the top. Who says that Asian male hairstyles can’t be mixed with braids? 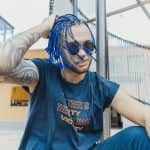 The man braid is another trend of now, and, it just so happens that the most popular things look unbelievable when they’re combined. You can either create a braid and tie it into a knot or simply leave it to fall on the shaved sides. 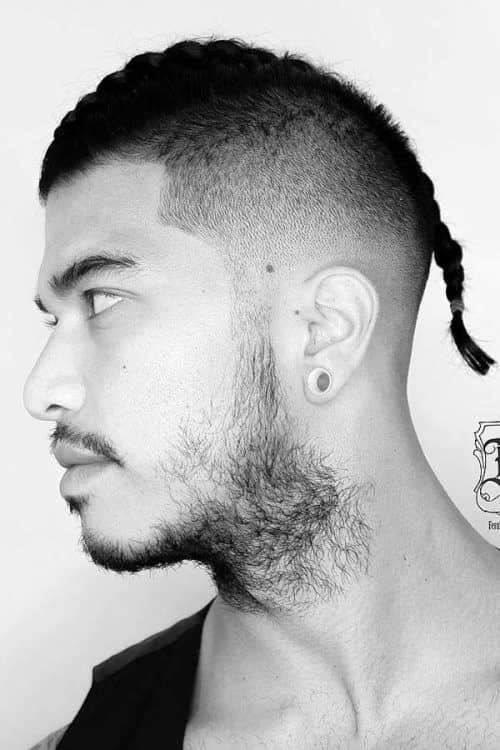 This Asian man bun has changed the image of the bun hairstyle for the better. Everything is super messy and authentic, and the little dread used as a tie adds a special charm to it. Yes, Asian long hairstyles know how to amaze with details. This is how the samurai top knot can let your imagination fly. The outlined high fade meets the braided top that turns into classic samurai topknot: isn’t that a cool take at the Asian trend? Although samurai hair has some length requirements for wearers, it offers great styling flexibility and variability. Keeping in mind its basic features is enough to give you an unforgettable modern look, and our inspo-ideas will help you out!